Magnetic random-access memory (MRAM) is a non-volatile device made of thin magnetic film that can maintain information without an external power supply, in contrast to conventional silicon-based semiconductor memory. It also has the potential for high-density integration and high-speed operation. The operation of MRAM involves the control of the magnetization direction by exerting spin current-induced torque on a magnetic material. Spin current is generated using electricity in conventional MRAM, but this study developed materials technology that generates spin current using heat. 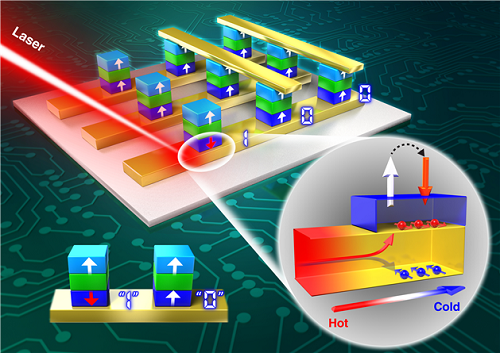 A KAIST research team led by Professor Byong-Guk Park of the Department of Materials Science and Engineering developed a material that generates spin current from heat, which can be utilized for a new operation principle for MRAM. There have been theoretical reports on the spin Nernst effect, the phenomenon of the thermal generation of spin current, but is yet to have been experimentally proven due to technological limitations. 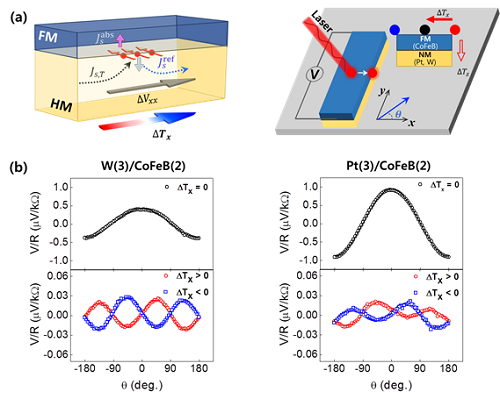 However, the research team introduced a spin Nernst magnetoresistance measurement method using tungsten (W) and platinum (Pt) with high spin orbit coupling which allows for the experimental identification of the spin Nernst effect. They also demonstrated that the efficiency of spin current generation from heat is similar to that of spin current generated from electricity. Professor Park said, “This research has great significance in experimentally proving spin current generation from heat, a new physical phenomenon. We aim to develop the technology as a new operational method for MRAM through further research. This can lower power consumption, and is expected to contribute to the advancement of electronics requiring low power requirement such as wearable, mobile, and IOT devices”. This research was conducted as a joint research project with Professor Kyung-Jin Lee at Korea University and Professor Jong-Ryul Jeong at Chungnam National University. It was published in Nature Communications online on November 9 titled “Observation of transverse spin Nernst magnetoresistance induced by thermal spin current in ferromagnet/non-magnet bilayers.” Ph.D. candidate Dong-Jun Kim at KAIST is the first author. This research was funded by the Ministry of Science and ICT.